!! colorful language advisory !! 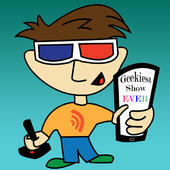 "Geekiest Show Ever 161 – Our Connection to Sanity"
Tap or click the play button in this player to listen to the show. People always ask me what apps they should install on their iPhone or iPad. I've been wanting to make a mini catalog like this for a long time and I finally started to scratch the itch. I've created a "What's On My iPhone" Pinterest board. I've embedded it below using a script. If for some reason it doesn't load properly, just click this link. For each pin I've included a short and sweet reason for why I chose to install the app and what purpose it serves. I started getting punchy after pinning for a while so some of them are a little silly. Several of them I wrote as if my great aunt were asking me about apps on her very first smartphone. I'm hoping I can use it as a point of reference because I get asked this question so many times and I always feel like it's more of a needs-based answer. This way the viewer can just skim through and see what might apply to them or maybe find something they hadn't even considered. Follow Melissa Davis's board What's On My iPhone on Pinterest.